When us Canadians have a garden space to work with, we can really get our hands dirty. There is nothing better than coming up with beautiful and innovative designs that enhance the entire home. Gardens can also bring a charming or fairytale like quality to a home design. 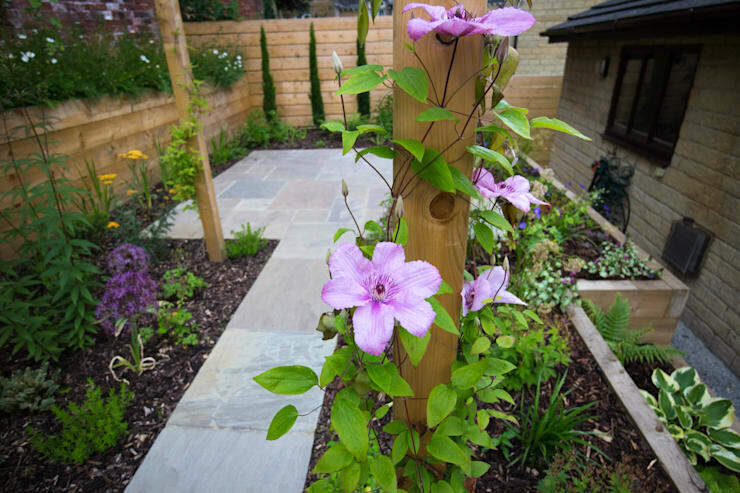 With the right flowers, plants and trees we can exude our personalities, creating an effective garden that works like artwork. What's more is that gardens are multi-functional. They give us an area where the kids can play, where afternoon tea can be enjoyed and where we can relax and feel one with nature. This allows us to come back to ourselves so that we can face the world from a place of peace and tranquility. 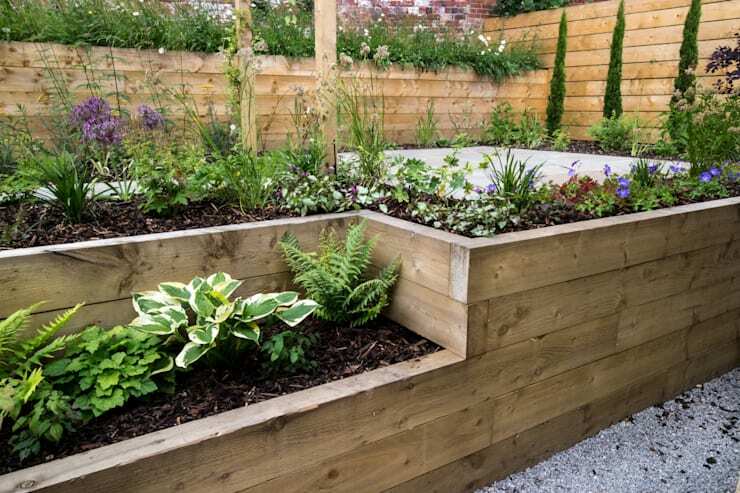 Today we are going to visit Leeds in the UK, where landscape design professionals JB Landscapes have created a beautiful and rustic garden that will certainly inspire today! You'll be itching to get out into the garden after this! Can you believe how exquisite this garden is? 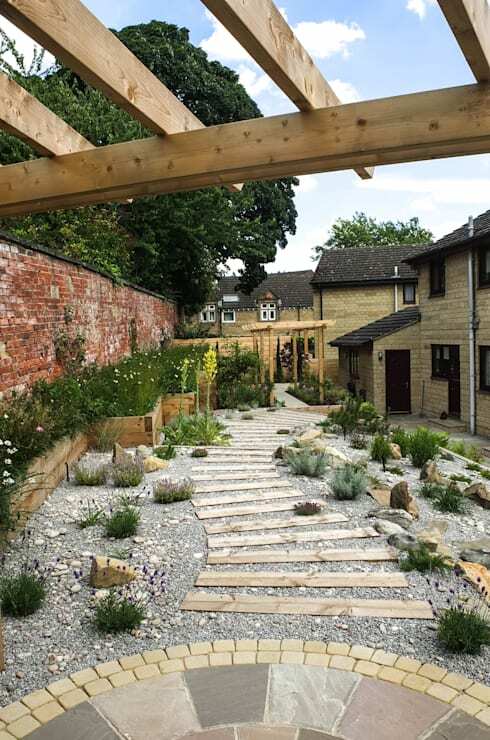 The designers have worked with the slope available to them, creating different levels and layers of a picturesque rustic garden. Wooden trays are layered up the slope, housing the gorgeous plants and flowers, while wooden steps lead up the garden, housing white stones. These bring a very earthy and sophisticated look and feel to the garden. The wooden pergola enhances the entire space, transforming it into a very elegant and stylish design. Like the look and feel of the pergola? 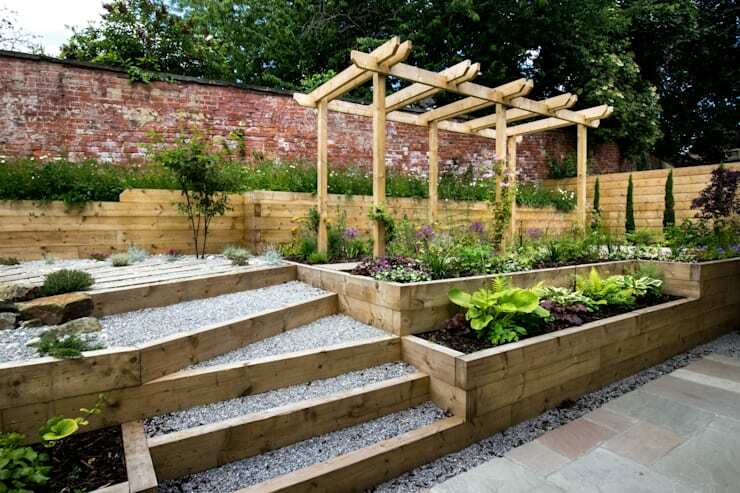 Have a look at this ideabook on how to build a pergola: a step-by-step guide. In this image, we can see how the garden extends along the entire length of the property. For most, this would be a very difficult space to work with, but here the designers have taken it into their stride. They've created a long and narrow garden that is rich in texture and depth. Another pergola is situated at the other end of the garden, bringing a sense of symmetry to the design. Don't you love how the different shades of green work together to paint a picture of beauty along the outside area? In this image, we can see the pergola a little bit more carefully. It has been very well put-together, bringing a new and refreshing look and feel to the garden. 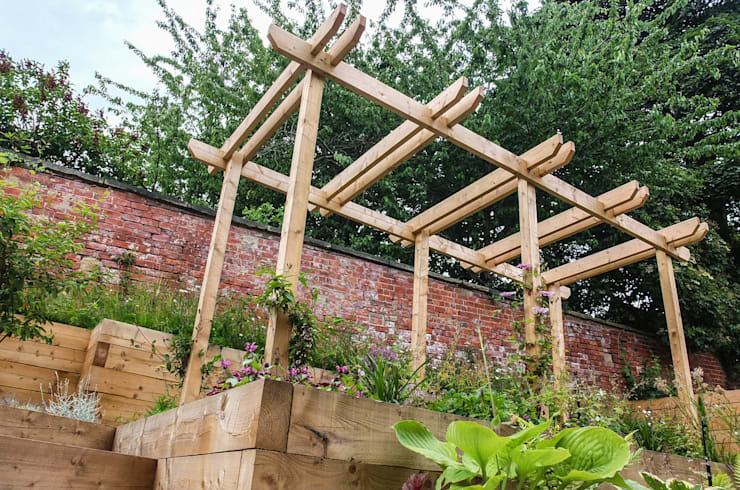 The idea is for vines to start growing along the pergola, which will be a very effective design that packs quite a punch. We can see at the base of the pergola how little flowering plants have started to grow up the pillars. While you need a little bit of patience to achieve this style, it will be worth the wait! A stone pathway runs through the garden, among a bed of grey pebbles. This allows family members to stroll through this beautiful space or kids to play. Don't you feel relaxed just looking at it? The design has been very strategically planned out, ensuring that the spaces between the stone steps are exact and that the plants around it enhance the look and feel. The greenery of the trees, flowers and plants contrast beautifully with the stone features. By bringing raw materials into the design, the rustic effect is reinforced. If we look at the flower beds a little more closely, we can see how carefully the plants and flowers have been planted. This has been no haphazard exercise. Every species of plants and flowers have been carefully chosen so that the colours, types and sizes work with one another. When it comes to your garden, you too need to be strategic. Speak to your nursery about the best flowers and plants for the climate as well as how big the plants and flowers will grow. Don't plant your seeds too close together and make sure that they get plenty love, care, water and sunlight. Tip: Use old wine palettes to create flowerbeds. You'll be recycling while saving money too! Have a look at this ideabook: cool furniture for almost nothing using palettes. Lastly, when it comes to your garden take the time to admire the beauty of nature. If you spend some time focusing on the brilliant colours, the extraordinary growth and the tremendous life that exists right outside your window, you'll find a sense of peace and harmony that no amount of money can by. 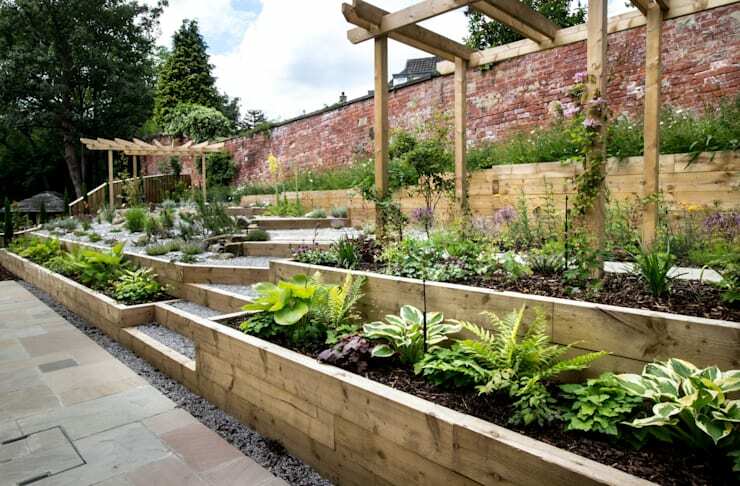 Would you want a rustic garden design like this in your home?